The global rice cultivation equipment market is expected to witness a growth of 5.2% CAGR during the forecast period from 2018 to 2026. SANJOSE, United States - March 22, 2019 /MarketersMedia/ — According to a new market report published by Credence Research, Inc., "Global Rice Cultivation Equipment Market – Growth, Future Prospects and Competitive Landscape, 2018 – 2026," the global rice cultivation equipment market is expected to grow by 5.2 percent CAGR over the forecast period from 2018 to 2026. The global rice cultivation equipment market is likely to witness steady growth, growing at a CAGR of 5.2 percent over the forecast period from 2018 to 2026. Increased rice consumption is one of the most important factors driving the growth of the rice cultivation equipment market worldwide. Larger part of the world's population relies on rice as their staple food and, as a result, it is critical to enrich agricultural methods to yield the same production. Rice cultivation is a complex activity involving a series of procedures to achieve the finished and final product. As a result, increasing demand for improved productivity and operational efficiency coupled with growing mechanization is expected to drive the rice cultivation equipment market in the years to come. 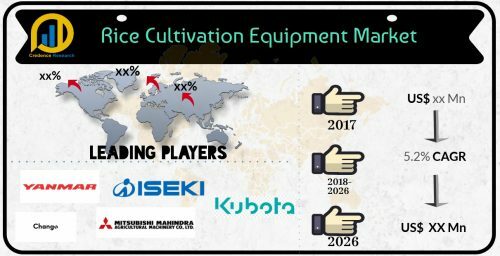 The global rice cultivation equipment market, based on equipment type was dominated by the rice transplanting equipment segment in 2017. Rice transplanting equipment works efficiently in planting paddy seeds and is helpful in improving both the quality and efficacy of rice transplanting process. The growth of this segment is mainly accredited to its growing demand for this equipment worldwide. Further, based on geography, Asia Pacific led the rice cultivation equipment market in 2017. This region's growth is due to the increasing adoption of rice cultivation equipment in countries such as China, Japan, India, etc. Rice is a staple food for several countries in the Asia Pacific region and therefore demand for rice cultivation equipment in this region is high. Growth is driven mainly by China as rice consumption is high in the country and is also among the region's leading rice producers. Major players in the rice cultivation equipment market include Kubota Corporation, ISEKI & CO. LTD, Yanmar Agricultural Equipment (China) Co., Ltd, CLASS KGaA mbH, Mitsubishi Mahindra Agricultural Machinery Co., Ltd., CHANGFA IMP & EXP CO., LTD, Shandong Fuerwo Agricultural Equipment Co., Ltd., Changzhou Dongfeng Agricultural Machinery Group Co., Ltd., Amisy Machinery, and Redlands Ashlyn Motors PLC among others. The presence of several big players has made the market competitive in nature. The manufacturers are focused on adopting advanced technological methods for manufacturing the equipment. Moreover, several strategies such as new product developments, partnerships are adopted to thrive in the competitive environment and gain an edge over others. Players are progressively focusing on distinguishing their product offerings through unique and clear value propositions to succeed, survive and endure with their counterparts.